Want to try something new and different? How about Hibiscus Brandy? Place the dried flowers and brandy in a jar or glass vessel, and place in a dark location. This infuses fairly quickly. As always, I tend to infuse for a long time to see how the flavors change and enhance. I let this infuse for about 2 weeks before straining out the flowers. The color is very deep and vibrant (the photo doesn’t really do it justice). After removing the flowers, I added about 1/4 c. of a thick simple syrup and let the infusion sit for another 2 weeks. With only 1/4 of simple syrup, this is very strong. It is probably not something you would want to drink on its own… however, it is winter – citrus season. Hibiscus and citrus go great together. Cocktail recipes for this liqueur will be forthcoming, so go out and get yourself some hibiscus flowers and start infusing! Can’t find hibiscus flowers? Try the Homebrew Exchange. They sell online, as well as having a storefront in North Portland. 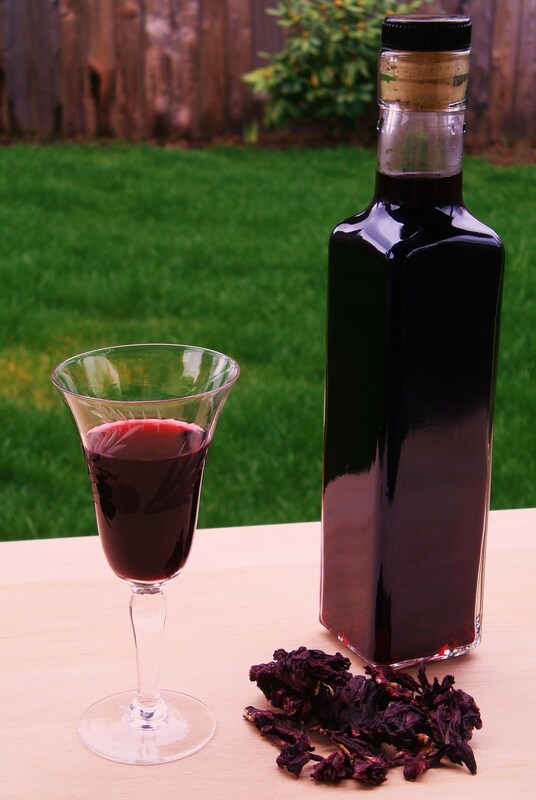 You could also make quite a tasty liqueur with any loose leaf hibiscus tea that you can find at your local store or tea shop. Categories: Infusion, Liqueur, Recipes | Tags: brandy, flowers, hibiscus, Liqueur, recipe, vodka | Permalink. This looks excellent! I’m definitely going to give it a try! I hope you like it… it is a strong flavor, but really good in mixed drinks! love the color; bet it tastes wonderful. I am a fan of candied/in-syrup hibiscus flowers, so this sounds great! wow! Those sound fabulous as well. What do you normally do with them? That syrup must be wonderful in cocktails. Yes, the syrup definitely goes in cocktails (yum!). Typically I drop a flower into the bottom of a fluted glass and create a champagne cocktail around it (or something with bubbles). The flower sits and opens up at the bottom of the glass so it’s pretty as well as being tasty. The ones in syrup have the consistency of fruit leather (fruit roll-ups). I get them from DeLaurenti: http://www.delaurenti.com/. But I’m positive you could nab them from Amazon. Perfect! I love champagne cocktails and I definitely need to try these. I’m in Seattle frequently so its not a problem if they aren’t on Amazon. Thanks for the link. Oh wow, I know what I’m infusing next! Are these dried hibiscus flowers you’re using the same as the ones I’ve gotten in the dried fruit bins in the bulk section of the store? Sort of chewy, like dried apricots? the ones I used were just dried flowers, nothing that you would eat. But I see no problem using the ones you described. They might be even better! What else have you tried mixing this with, and what’s the final proof? Hi, thanks for the great questions! So far we have tried this in a sidecar, mimosas, mandarin hibiscus, and the Sunset cocktail. Most of these we featured on the blog. I think it would be really good in fresh squeezed lemonade, but I haven’t tried that yet. As for the proof, I don’t have a hydrometer, so I can’t say for sure. The brandy stared at 80 proof’ and I think the simple syrup would bring it down to about 70. The hibiscus would bring it down a bit more, but the actual volume of the hibiscus was not all that great. I don’t think it would bring the proof down below 65 or 60 at the lowest. But I should probably get a hydrometer so I can measure! Do you have one? I made this recently and it was amazing (though I admit I only let it age for a week after infusing and straining it). Unfortunately it was so delicious that my husband and I drank it all in a couple of days. I’ve already got a second batch going, but I’m not sure that I have the willpower to wait another month for it. Thank you for all your wonderful recipes, I look forward to making many more delicious liqueurs from your blog! Thanks! So glad you are enjoying our recipes. It is fun to experiment with lots of different ingredients!